Friends ask about what’s happening to my knee, and here is the story: the company organizes 2-day or 3-day district concerts nearly every month. I’m responsible to the sound system and band setup. Tasks included preparation work before the show (moving the gears out, installing additional gears to racks, packing cables and snakes…), 1st day: transportation, setup of band and sound system, sound system checking and fine-tuning, technical touch-up, rehearsal, show, relocation of gears according to venue’s request; 2nd day: re-setup of band and sound system, sound system checking and fine-tuning, technical touch-up, rehearsal, show, moveout, transportation. I was physically drained after the three-day preparation+setup+rehearsal+show+moveout. Statistically I worked 11 hours on Saturday (usually I have 13 hours to finish all tasks in previous concerts) and 8 hours on Sunday. After moving all the gears back to office, my body was so weak that I can hardly walk. With a slight twist when stepping onto a bus, my right knee got hurt. I didn’t go to the retreat camp on Monday and Tuesday, having good rest at home. The condition got a lot better. However when I was back to work on Wednesday and Thursday, the pain came back, and extended to my back and neck. The most serious moment happened in the outreach event on Thursday with colleagues and our guest Frances Chiu. From time to time I needed to sit on the couch when operating the sound system. I couldn’t help in moving gears and part of the setup too. Since my knee got hurt, and I felt so weak physically to use my leg muscle, I tended to avoid using my knee at all. You can see my weird postures in those days. I walked like a lame. However the pressure shifts to my back near waistline, and it hurts the muscle around. The pain is acute while long-lasting, and it’s more serious compared to the knee pain. Following my chiropractor’s (脊醫) advice, I have to walk in normal posture so as to save my back. Furthermore I wear protective measure on the right knee and waist to add external support. With the electric and ultra-sound treatment in chiropractor’s clinic, and cold treatment at home, it’s getting a lot better today. The backpain appears less frequent, with the expense of knee pain’s coming back. I’m so depressed that I need to spend so much money in getting myself recovered. I’m so depressed that I can’t hang out in Christmas time. I would be desperately depressed if I can’t join the Trio Spin Pre-New Year Milonga on 30 December. To help me a bit out of depression, I visited my nail artist yesterday after having treatment in clinic. Here comes Santa! 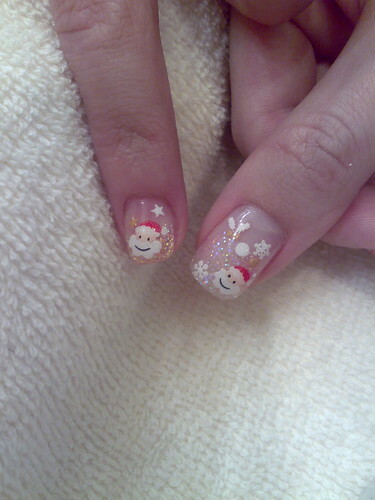 And there’re a lot more including reindeer and snowflakes!!! And I guess you’d noticed it’s snowing inside “Dream a little dream” of embrace.hk. Hope you’ll fall in love with the freezing winter this year! Wish you a merry little Christmas! It’s my first time to visit you blog, very nice and i love the snowing effect. Oh… too bad. I hope it’s not hurting too much. Still feel pain? Please take more rest la! Sleep early! How are you know? Wish you can recover soon!!! The Santa is cute! I have cut short all my nails la…hahhaaa…too inconvenient for me!